Dr. Mohebi, I thank you and your excellent team of professionals at your office for making me feel so good about myself. 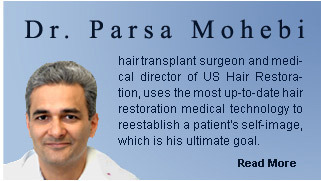 After great research into hair restoration, I selected you as the doctor to restore the youthful look that I once had. As a teenager and as a young adult in my 20's, I always had a full head of hair, but was born with a high hairline. This genetic trait I got from my mom's side of the family and therefore, my mother always tried to make me feel better by saying, "...a high forehead is a sign of intelligence". However, as I reached my 30's I noticed my hair thinning at the top of my head. My existing high hairline looked more pronounced. This was in the early 1990s where hair transplant technology involved using micro-mini grafts. At the time, this was considered state-of-the-art hair restoration. The surgeon was able to dense up the thinning hair at the top of my head to create the original look that I always had, but still had the high hairline. Now that I am in my 40's, once again, I noticed the hair on the top of my head was starting to thin out; The original hair, (not the transplanted hair). Dr. Mohebi, this is when I decided to come to you. I met you for my consultation in September 2008. After you performing an analysis of my hair, you drew a hairline that was lower and more suitable for my facial features. I was surprised that the hairline you were suggesting was lower than I ever thought I could have. You explained to me that the new technology used is done by follicle transplant and is much more natural looking and I should not be afraid to consider your recommendation. Well, as you know, I did and went through with the procedure. I love my new hairline. This is the hairline that I have wanted all my life. This new look has subtracted years off my face and given me tremendous self-confidence. So now I have the intelligence that my mother always talked about, but look much better. I thank you and your excellent team of professionals at your office for making me feel so good about myself. Please feel free to post this e-mail on your website. Also, you may give out my cell number to anyone who has any questions about my feelings and the procedure I went through. Indeed, it was Dr. Mohebi’s “bedside manner” that told me in my heart that this was the right choice. I’m a current patient of Dr. Mohebi. I underwent Follicular Unit Transplant (FUT) in February of 2008. It has only been a few months since the procedure was performed. My results have exceeded my expectations all ready, and I feel so relieved over my decision to have the operations that I wanted to give a testimonial for other people to know that there is something that can be done to help. That is when I found Dr. Mohebi and his team of technicians. When I contacted the office for a consultation. I was treated with so much care and concern. From that point, I knew this was the doctor I wanted to see to treat my condition. The day of the operation was nerve racking for me! It is not every day that a decision like this is made in a life span. Once again, my anxiety levels were put at ease upon entering the office. Dr. Mohebi and his team were so aware of how hard it can be to move ahead in spite of fear. Ultimately, the way Dr. Mohebi spoke to me and reassured me in those first few precious minutes, before the surgery prep, kept me from flying out of the place. Indeed, it was Dr. Mohebi’s “bedside manner” that told me in my heart that this was the right choice. I did not want to go through the hair loss process in life without trying to do something about. There are circumstances in life that you must accept. However, I did something about it and I feel so much the better for trying. I’m also on a daily prescription of Proscar (Finasteride) for long-term hair loss maintenance. It has been almost six months of daily use and my hair loss has stop and I’m growing hair again. I can’t thank Dr. Mohebi and his team enough for all they have done for me! After great research into hair restoration, I selected you as the doctor to restore the youthful look that I once had. As a teenager and as a young adult in my 20's, I always had a full head of hair, but was born with a high hairline. This genetic trait I got from my mom's side of the family and therefore, my mother always tried to make me feel better by saying, "...a high forehead is a sign of intelligence". However, as I reached my 30's I noticed my hair thinning at the top of my head. My existing high hairline looked more pronounced.